Day 2: Gorilla trekking in Volcanoes national park . The guide will later transfer you back to the airport. 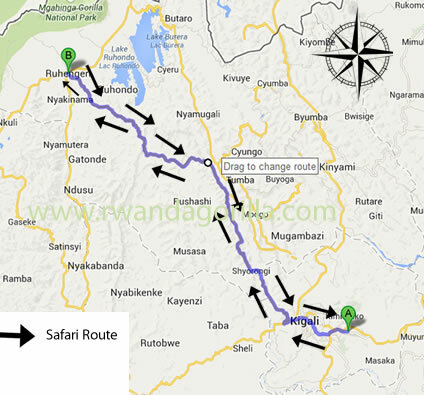 In the morning, you will be picked from your hotel for a transfer to Kinigi in Ruhengeri. Too many of our guests, a visit to Iby’wachu Village is so rewarding. Dinner and overnight stay at Mountain Gorillas view Hotel/ 5 Volcanoes Lodge (Luxury)/ Da Vinci Lodge, Gorilla Solution Lodge, Le bamboo Lodge (Deluxe)/Muhabura Hotel (Budget). In the morning, assemble at the park headquarters for a briefing from the park warden along with your trekking gear, drinking water and packed lunch. Later proceed to the forest to track the gorillas, an activity that will take you 1-8 hours depending on the movement of the apes in their natural wild. After meeting and staying in the presence of the gorillas for a maximum of an hour, the guide will transfer you back to Kigali for your scheduled flight. 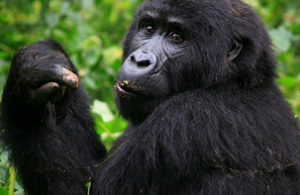 A 5 days Gorilla trekking in Volcanoes National Park, the home of mountain gorillas in Rwanda. This is the best trip for primates enthusiasts! 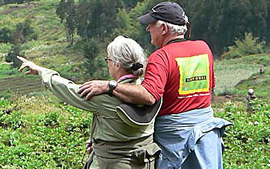 The 6 Days Uganda Gorilla safari takes you to Bwindi national park, Kibale national park for chimps trekking & Murchison falls national park for great views of the waterfalls. A Grand Safari in Uganda that includes Uganda Culture, Gorilla Trekking,chimps trekking, Murchison falls & Lake Mburo tour. This is one of the most rewarding trip offering much to see in less time! Gorilla Trek Africa makes sure all our clients stay at the most relaxed during a safari with us, clean and highly rated safari establishment in the different destinations Uganda, Rwanda, Kenya, Tanzania, Burundi, and DR Congo. Our preferred high-end hotels in Kigali are Serena Kigali Hotel, Gorillas Golf Hotel, and Mille Collines Hotel, In the mid-range category, we have The Garr hotel and Lemigo Hotel. Hotel gorillas is a Five-star hotel situated within Kigali city. The charming establishment comprises of 31 fully furnished rooms, a cozy bar & restaurant, and a swimming pool. Located in Kigali, the historical hotel offers exceptional comfort to all its clients. Elegantly furnished rooms and suites with a mix of traditional and contemporary handicrafts and art. Located in Kigali, Garr hotel with beautiful and comfortable rooms featuring room service, phone facilities, hot water, airport pickup on request, Internet, laundry and drying cleaning services. Beautiful hotel for all types of travelers offering visitors high-quality comfort and very clean Rwanda hospitality. Centrally situated in Kigali city, just 3 minuted drive from the Kigali international airport and hence a very convenient accommodation in Kigali. Situated along the foothills of the Virunga Volcano. The Lodge comprises of 2 cottages accommodating 4 guests in two large bedrooms each with a king size bed. The lodge comprises of 30 cottages built on 4 acres of land on the slopes of Mt Sabinyo. The cottages are made of stone and thatch with en-suite facilities. Le Bambou Gorilla Lodge is located in Rwanda’s Northern province, in Volcanoes National park – comprising of 9 comfortable self-contained Bandas and a one family cottage. Three stars Hotel, located in Musanze City; offering Luxurious accommodation to business and Leisure tourists to Musanze. An exceptional dining experience awaits you. 3 Star hotel situated 10 km from Volcano NP with 48 fully furnished rooms & 4 elegant suites with an intimate atmosphere to make clients comfortable. Located in Musanze district. Nyungwe Forest has a limited range of accommodations. Our preferred luxury lodge is the magnificent and award-winning Nyungwe Forest Lodge. In the mid-range, we have Nyungwe Top View Lodge. Nyungwe Top View Hill Hotel is located on the edge of Nyungwe Forest National Park. The property offers a total of 12 comfortable cottages featuring a welcome fireplace for cooler winter evenings. At Lake Kivu, our high-end choice of the lodge is Lake Kivu Serena Lodge. In the mid-range section is Paladise Malahide, Hotel Gorillas Lake Kivu, and Palm Beach Hotel, among others. Located on the white sandy shores of Lake Kivu, the hotel is overlooking its own private beach and offers; 66 luxury rooms, executive suites and family accommodation, a panoramic restaurant. Paradise Malahide is a charming and friendly guesthouse with 10 rooms – and 4 apartments. It’s well run, and with great food and a lovely location, we think it’s excellent value for money. Gorillas Lake Kivu Hotel is located in the town of Gisenyi at the northern end of Lake Kivu in Rwanda. Very comfortable room, good swimming pool area garden area is very relaxing Staff are friendly. In Akagera national park, we use Ruzizi tented camp for high end and Akagera game lodge for the budget. The Ruzizi Tented Lodge, a 14-bed tented eco-camp. Ruzizi is built on the shores of Lake Ihema, Rwanda’s second largest lake, tucked away in a tract of unique riverine forest. Akagera Game Lodge is located in Eastern Province; about 2 hours drive from Kigali. The Akagera Game Lodge has an attractive setting on a ridge overlooking Lake Ihema.